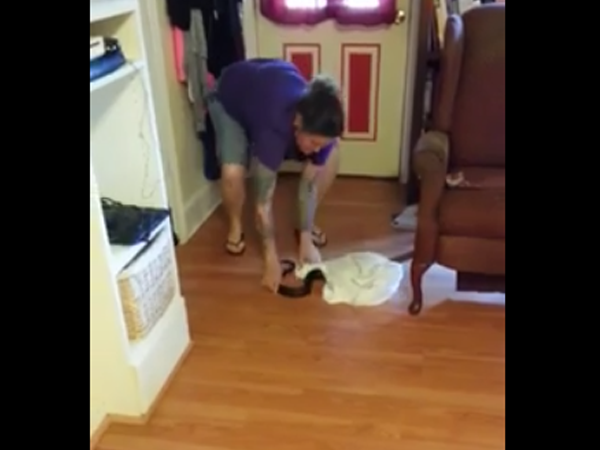 WATCH: Woman catches snake using a pillowcase! This lady has some serious guts! Imagine coming home to find a massive serpent chilling in your living room. The folks who were level-headed enough to remain calm would probably call wildlife control or a snake handler -- but not Sunshine McCurry from Forest City, North Carolina. Upon coming home to find a huge black snake in the middle of her living room, Sunshine decided that she would take matters into her own hands. In a video clip of the bizarre incident, you see her stalk into the room carrying an empty pillow case. She then calmly bends down, grabs the snake by its head and proceeds to attempt to put it inside the pillow case. The snake puts up a bit of a fight but Sunshine doesn't seem to phased at all, not relenting until the serpent is safely stuffed inside the pillow slip. Read more: This mom found a snake in a seriously creepy place! She then takes the snake outside and measures how long it is using her feet before she lets it go. In the clip she can be heard calling out, "We caught another snake!" -- so this is a regular occurrence in her home?